I’m always a happy reader when I have a new Ken MacLeod book waiting for my attentions, he has, consistently, been one of the most interesting and thoughtful science fiction writers in these islands for the last couple of decades. As well as intriguing thoughts and gripping stories, Ken is also adept at doing what the best science fiction does – using SF to address the problems of human nature. 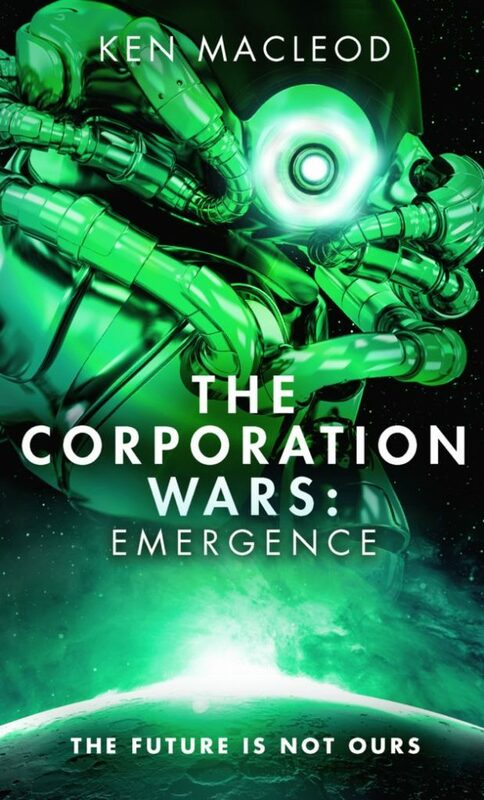 And in the Corporation Wars trilogy that’s no mean feat, considering, for the most part, the various characters in this series aren’t actually human. We have robots who have achieved sentience, we have computer AIs which oversee much of the Earth policy in this distant proto-colony system, and we have the emulation of human minds running in digital simulations or, to interact with the real universe outside the computer reality, downloaded to mechanoid “frames”. The first two volumes have seen these deceased humans – fighters and terrorists from two rival factions, the Axel (accelerationists) and the Rax (reactionaries, basically racist, Nazi, power-hungry types), their memories and minds digitally resurrected to man combat machines for Earth, as compensation for what they put the world through during their millennia-gone battles. But twenty light years from home and thousands of years into the future, not even in flesh bodies, these groups can’t help but revert to their previous behaviour… And yet some are starting to learn, starting to look back on what they did before their (usually violent) deaths, on how Earth society has evolved since then, and, importantly, to think about the now sentient robots they have been tasked with dealing with. After much evolution and interaction – not to mention some spectacular action – in Dissidence and Insurgence, Emergence continues seamlessly (the overall effect, I found, is less that of reading a trilogy but one long tale with small restful pauses), all of the characters now very firmly established, developed. There are no ciphers or stock characters here, even the robots, the newest intelligent beings in the story, are evolving rapidly, showing individuality, wit, even friendship and care for others. And then there is the massive “super habital” world the colonising corporations have been orbiting for so long, finally brought fully on stage, and opening up yet another avenue for exploring how diverse and rich, and astonishing, life, in any form, can be. There’s plenty to chew over here, from the rights of any sentient being (human, posthuman, robotic or otherwise) and how we deal with them (our behaviour to them saying much about our own moral faculties – or lack of them) to the use of economic and military power. In the Rax I thought I detected more anger than in the preceding volumes; here they are not just the far-right, but quite clearly Nazis, right down to the arm salutes as one group makes a grab for power, and I thought perhaps this was a quite understandable reaction to the hideous growth of such hate groups in the real world. But as well as the thought-provoking elements and the cracking sense of pace and action which pushes events along at a gratifying clip, there is also some humour here – the nasty space-Nazi trying to justify racial superiority when he is nothing but a digital emulation of his old mind in a robotic frame (ah, but an emulation based on a white brain! Yes, that’s how stupid and bigoted these people are). It’s a superb casserole of ingredients, building to the boil at just the right moment. Emergence is out now from Orbit Books, you can read about the first volume here, and volume two here, while we have a recent report on some of the science fiction events Ken had as a guest selector at the Edinburgh International Book Festival here.